Powers/Abilities: As long as he was not born he moved around in sac with tentacles as legs. He slept and screamed at the same time. He was totally insane. He was born after he awoke and immediately became a giant. He possessed superhuman strength and grew further by feeding off the negative energies coming through the Dreamland portal. He also used the portal to communicate with his brother Lucre. In the process he was able to send demons through the portal into human hosts sitting on the Nightmare Chair on Earth. (NM#1 (fb) ): Mrs. Shreckenadder knew that she was pregnant with twins and bought a stroller for twins. (NM#2 (fb) ): Exile shared the womb of his mother with his twin brother Lucre. (NM#4 (fb) ): Exile died in the womb and continued to share it with his twin brother. Together they spun in a state of permanent birth trauma. They were both insane with pain. Exile was never born. (NM#4 (fb) - BTS): Exile came to the Realm of Exiles and lived there unborn. (BTS - NM#1): He never forgot about his brother and one day he left the Realm of Exiles to search for him. He entered Nightmare's realm on his search. (NM#1): Exile screamed while he was asleep. Paranoia and Phobia saw him and were afraid. Exile was born when Paranoia and Phobia were on their way to claim the portal to the Dreamland. He grew to an enormous size and squashed all demons in his way. The others saw his power and kneeled before him. Exile went to the portal and wanted to know where his "other" was, but Doggerel didn't know. He showed Exile the terrible things that happened on Earth since Nightmare stopped siphoning the negative feelings away. Exile didn't care and pushed Doggerel away from the portal. He found Lucre and caused a nightmare in which Lucre learned about his brother. (NM#2): Exile went to his new slaves and returned to the portal to the Dreamland. He destroyed the ground around it and ordered to build a tower around the rock. His slaves built it, but the impatient Exile wanted it to be finished faster and Doggerel promised him that the tower and the antenna on it would be finished when Lucre went to sleep. Exile then went to sleep himself until it was finished. Later he met Lucre in a nightmare. He showed his brother that they shared a womb together. Exile wanted to become one with him again so that he could feed off him. He wanted to seal their pact of blood brothers and showed Lucre a giant antenna from which they fell. After the dream Exile decided that Nightmare had to die so that he could become the undisputed ruler of Nightmare's realm. (NM#3): A woman sat on the Nightmare Chair and Exile appeared to her. Exile ordered Paranoia to kill Nightmare and threw him through the portal to the Dreamland into the woman on the Nightmare Chair. A short time later Phobia was sent to Earth with the same order. Exile then met Lucre again in a dream and told him to get Nightmare into the Nightmare Chair. Exile sat down in front of the Dreamland portal and waited. (NM#4): Exile screamed when he found out that Paranoia had failed to murder Nightmare, but Doggerel brought two new fear assassins to him in the form of Dementia and Neurotica. Doggerel told him not to touch Neurotica because she didn't like germs. Exile just told her to kill Nightmare and watched her go through the portal. He then threw Dementia through the portal too with the same order. Exile was tired after this and took a nap in front of the portal. He was still asleep when Nightmare returned to his realm. Exile attacked him and rapidly grew to enormous proportions. He wanted to kill the dream lord, but Nightmare was too powerful in his own realm. He grew even bigger than Exile and wanted him to leave. Exile babbled about his twin Lucre and being a dead baby that was born alive. Nightmare thought about a way to use this. He saw that Exile was insane, but he wanted to give him the soul of Lucre if he returned to the Realm of Exiles. Exile should keep Lucre as a prisoner there. Exile was okay with that. On Earth Nightmare lured Lucre into the chair. The souls of Exile and Lucre became one and they disappeared together into the Realm of Exiles. Comments: Created by Ann Nocenti, Joe Bennett and Mike Witherby. I called Exile a mutant because he was born with superhuman powers. Although born is probably the wrong word. 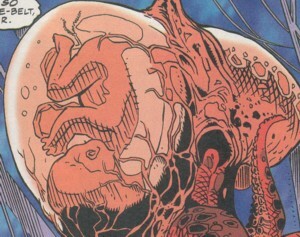 --Mmmm...he gained his powers after dying and being sent to the Realm of Exile. I'm going with human turned demon. I have no clue why and how Exile was brought to the Realm of Exiles after he died in the womb of his mother. It was the HQ of Exile. Exile tore down the area around the Dreamworld portal and around the remaining rock his tower was built by Doggerel and the other slaves of Exile. On top of the tower an antenna, identical with the one Lucre put on the Nightmare Chair, was put. Exile used the tower in combination with the Dreamworld portal as a way to sent demons into host bodies sitting on the Nightmare Chair on Earth. He also used it to return Nightmare from Earth through the Nightmare Chair to his own realm. The tower was partly destroyed in the short fight between Nightmare and Exile. Afterwards the area where the tower stood was returned to its former state by Nightmare. It was the place where Exile lived among other exiled beings. It exists somewhere beyond the Realm of Nightmare. Doggerel was afraid that it would collapse in calamity if Nightmare left his realm, but it didn't. Exile returned with the soul of his brother Lucre to the Realm of Exiles after his defeat by Nightmare. I guess the Realm of Exiles is the same as the Dimension of Exiles seen in the Tetrarchs of Entropy storyline by Hama over in Avengers, which was presumably also the prison to Baal and Ice Box Bob.